The American Cancer Society and American Lung Association have warned that smoking hookahs may be as harmful to personal health as smoking cigarettes. WSU is still seeking participants. Volunteers must have smoked a hookah three or more times a week for the last two years and be willing to visit the lab twice weekly for 20 minutes. It’s worked with cigarette smokers, drug addicts and children who stutter. 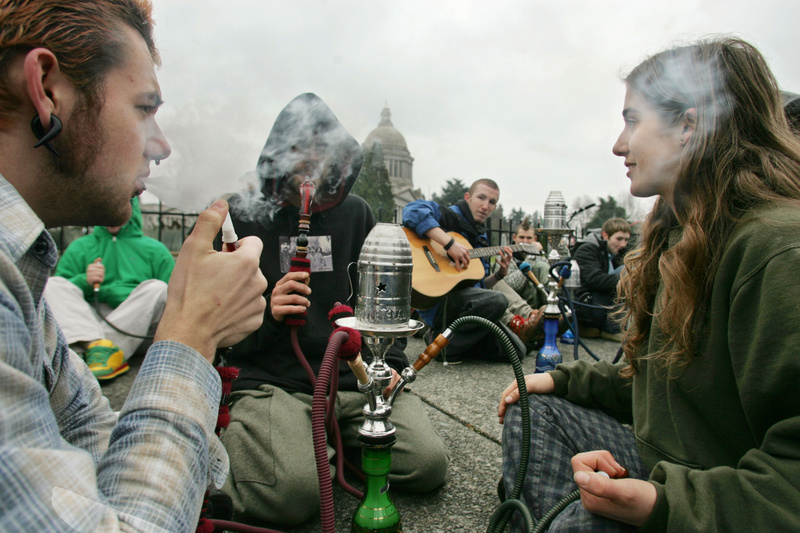 Researchers at Washington State University hope it can help wean people off hookah. This summer, the WSU College of Nursing is spearheading the first known study of addictive behavior related to use of hookah, the popular water pipe. The five-week study poses the question: How is quitting hookah different from quitting cigarettes? Kawkab Shishani, assistant nursing professor and lead researcher for the study, already knows there are different smoking behaviors. She proved all this in a 2010 study, published in Addictive Behaviors, which also found hookah smoking leads to tobacco dependency through sporadic but heavy use. She documented side effects of smoking hookah tobacco both containing and not containing nicotine. Nicotine, predictably, caused an increase in heart rate and blood pressure. But even non-nicotine, or herbal, tobacco caused increased levels of carbon monoxide, which reduces the amount of oxygen to the heart and brain. “These physiological indicators show that while smoking waterpipe, there are changes – and these changes are harmful to health,” Shishani said. Using hookah, or smoking tobacco through a water pipe, has grown in popularity in the U.S. over the last decade but remains a virtually unexplored topic for scientists, Shishani said, despite the wealth of data on cigarette smoking. The WSU study, which began July 1 and is funded by the National Institute on Drug Abuse, adds to the nascent sector of research by treating addicts with contingency management, a treatment that rewards good behavior. Shishani said the rewards are monetary, but she declined to give details because it would compromise the study. John Roll, senior vice chancellor at WSU health sciences, inspired Shishani to try contingency management, also known as motivational incentive, on hookah addicts. Addictive behavior, Roll said, indicates a drastic shift in a person’s motivational psychology. They become obsessive-compulsive about the drug and neglect all other needs and wants. The treatment aims to “help people shift that hijacked motivation back to normal,” Roll said. “I think almost all treatments seek to decrease the reinforcing effects of the drug,” he said. He added that the incentives should be coordinated in the “contexts of a lot of other supports,” such as counseling. Mark Ornelas, a psychology and philosophy student at Gonzaga assisting with the study, said the research will hopefully help determine what reward is most effective to kick the habit. Ornelas said he believes the mix of chemicals present in hookah fuels an addictive behavior not found in cigarette addiction. “People can be chemically addicted to certain things but they can also be psychologically addicted to the way it makes them feel,” Ornelas said. He compared hookah to a cocktail party with people who prefer smoking to drinking. Austin Graham, an employee at Spokane Cigar, said while he’s not a heavy hookah smoker, he’ll join his friends when they go out to smoke. Store manager Kami Hooper said because hookah contains a much lower level of nicotine than cigarettes, it would be much harder for a user to become addicted. Still, the store’s hookah clientele have wide-ranging ideas on its effects. The World Health Organization advised in 2005 that “contrary to ancient lore and popular belief,” hookah smoke can cause cancer as well as addiction. Smoke inhaled during one session of hookah could equal the smoke inhaled from 100 or more cigarettes, WHO found. WSU is still seeking participants. Volunteers must have smoked hookah three or more times a week for the last two years and be willing to visit the lab twice weekly for 20 minutes.